Loosely translated, the word calabacita means little squash in Spanish. Calabacitas is a traditional Spanish skillet meal comprised of squash, tomatoes, onion, corn, garlic and green chiles. While we were in New Mexico last month, my sister made the best calabacitas I had ever tasted. We stuffed the spicy squash into bean burritos and it was delicious that way. 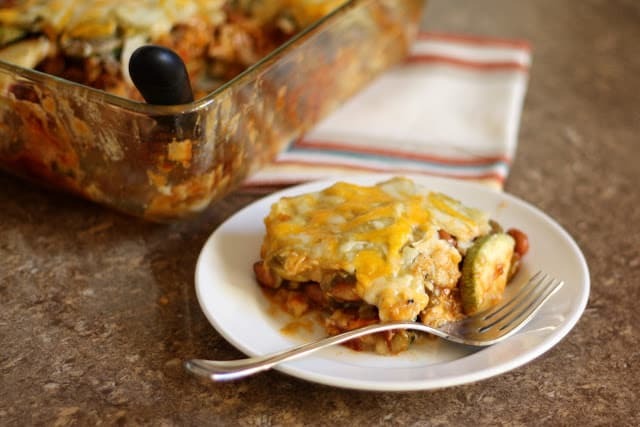 Once I was home, I was inspired to try an enchilada version of her calabacitas. My non-squash loving children devoured this meal and informed me that if I kept making squash taste this good, they would keep eating it. Apparently, I completely burned them out on my favorite vegetable with our over-abundance of squash from the garden last year. For this dish, I used three different summer squash, a yellow crookneck, a Mexican grey and an Italian zucchini. Any combination will work well for this. Simply use about 1 1/2 total lbs of squash. In a large skillet, warm the oil over medium high heat. Add the onions and saute for 2-3 minutes. Add the squash and the corn and continue to cook for another 3 minutes. Add the beans, garlic, green chile and spice blend. Stir to combine and cook another minute or so. The squash should still be fairly crisp and not at all soggy. Remove from the heat. Preheat oven to 350 degrees. In the bottom of a 9x13 dish pour about 1 cup of green chile sauce into the bottom of the dish. Layer tortillas across the sauce and top with half of the squash mixture. Place the chicken on top of the squash and sprinkle with about a cup of cheese. Layer tortillas across the cheese and then pour red chile sauce across the tortillas. Spread with the back of a spoon to coat the tortillas if necessary. Repeat the squash layer over the tortillas. Sprinkle with another cup of cheese and then layer tortillas across the cheese. Pour the rest of the green chile sauce over the tortillas and then sprinkle generously with cheese. Bake until the cheese is melted and bubbling. Let cool for at least ten minutes before slicing. Serve with sour cream and tortilla chips if desired. Enjoy! 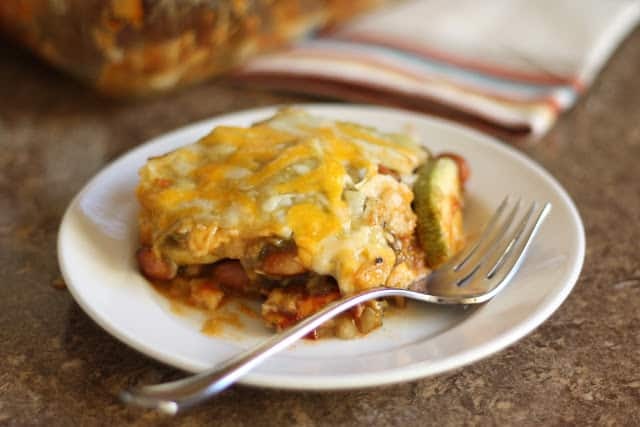 Another great enchilada recipe Mary! I used squash and black beans in an enchilada recipe one time and loved it. I think your kids are awesome - eating squash and telling you how they like it. You are doing a great job! Have a lovely weekend. I would love to eat this! Looks fantastic and a great way to use any squash excess! 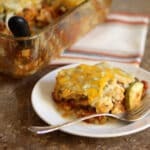 This dish is completely new to me, and I love that you've incorporated it into one of your enchilada lasagnas. This looks so good! I'm trying to eat more yellow veggies and this would be the perfect way to get them in. Thank you for sharing yet another delicious eat! Looks yummy. I might just have to make this for my crew even though I can't eat the cheese... It looks like something they would excited to consume! Two chile sauces? Mercy! This would be a big hit for me, I know. I need to get my New Mexico cooking book out and dabble some. Hello! Can this recipe be made the day before serving? If so, would you cook it the day you prep it and then reheat it on low in the oven before serving? Or let it sit overnight in the refrigerator (uncooked) then cook it the day you serve it? Thank you! When I know that I'll be serving enchiladas the following day, I typically place the uncooked enchiladas in the fridge and bake the following day.